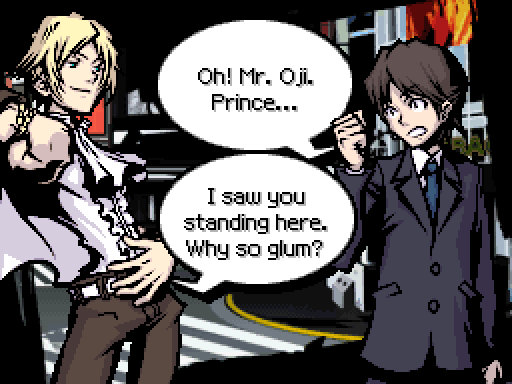 : Whats that guy mumbling about? : Three more hours? Its noon now...so in three hours...itll be 3: 00! Hey! I think this guy might be the key! Doesn't Japan use what Americans call "military time" and it would be 15:00 when the commercial happens? T-talk, dammit! Why is she so quiet today? : So, um, yeah... Lets scan him. OK? 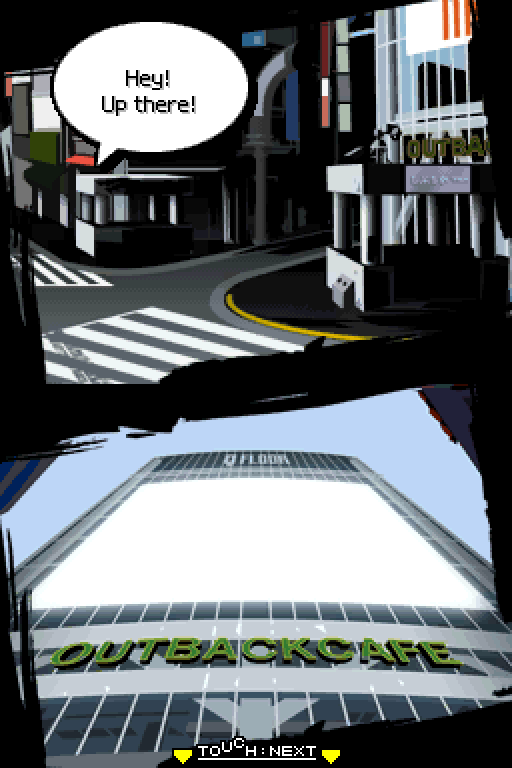 Something I forgot to mention is that Shiki isn't saying much. 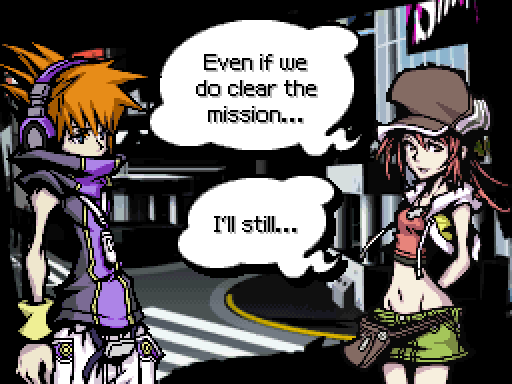 Her usual battle talking is missing and the running dialogue is different. Normally she's all "we should run if it's too dangerous!" but now there's just an awkward silence. : Catch the eye...Thats it! Hey! This must be our mission! ....... Think about it. The time matches up--3:00. And catching the eye... Eye? View? Same thing. 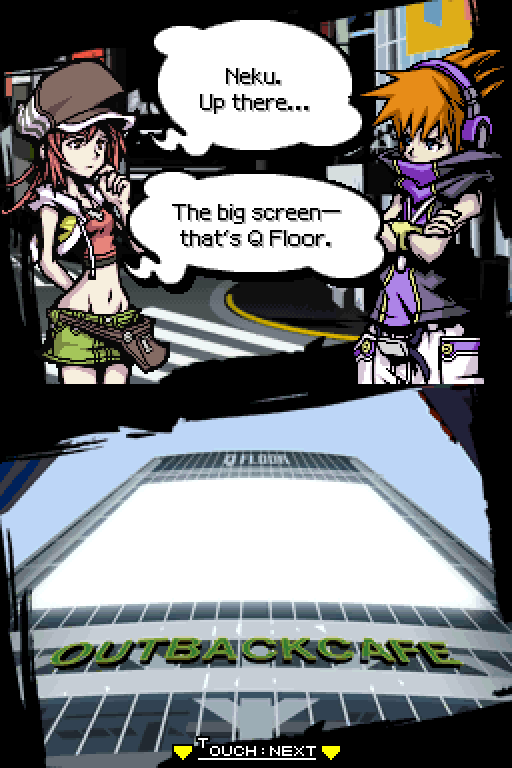 : But whats "Q Floor"? : The one playing commercials? This is all starting to make sense! 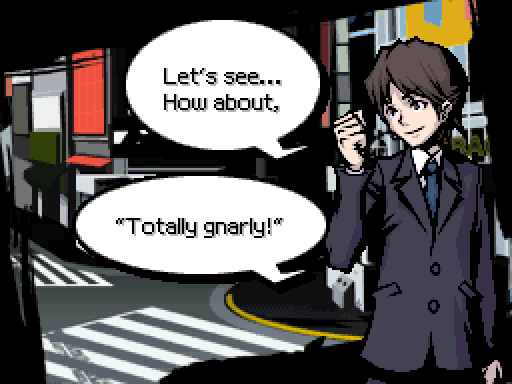 : So dominating the scramble crossing view means getting the crowd here to watch that guys ad? : It sure seems that way. : ...... Thatll never happen. People look straight ahead when they cross. Or at their feet. Then our mission is to get them to look UP. They have to see that ad. : What do you think the ads for? Like I know. 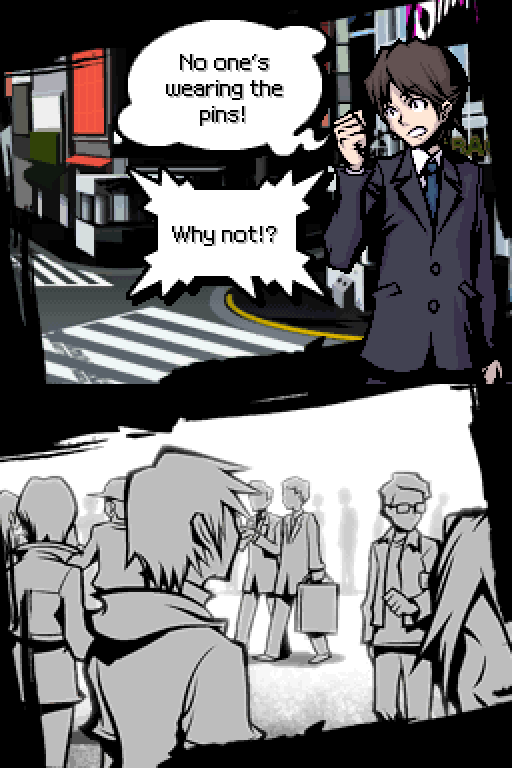 ...Maybe he can answer that. Great. The Noise have a hold on him. You know what that means. He's possessed by chump noise. It gets erasitized. 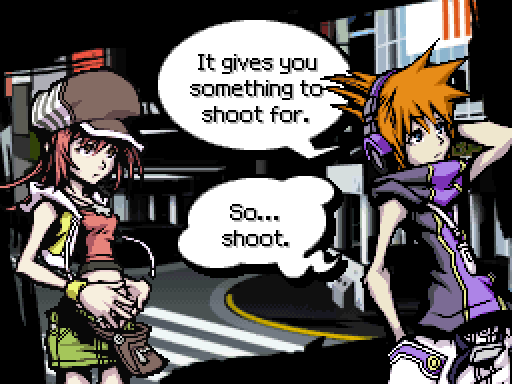 I should really buy Neku's safe landing. In fact I do at some point soon. : But its my job to MAKE them the next big thing! : That pin... It looks just like this one. This is what hes advertising? So maybe this is for the mission? 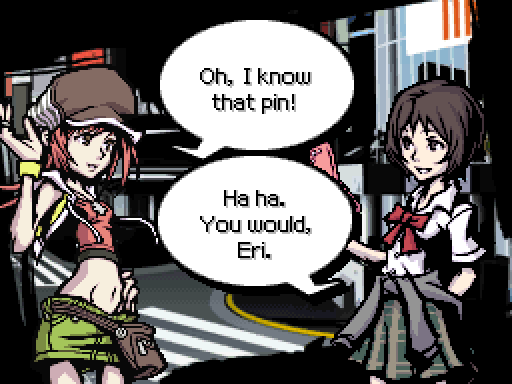 : Its just a regular old pin. No ones gonna watch an ad for it. Thats for sure. But the guys a pro, right? Im sure hes at least got a plan. : ...... OK! 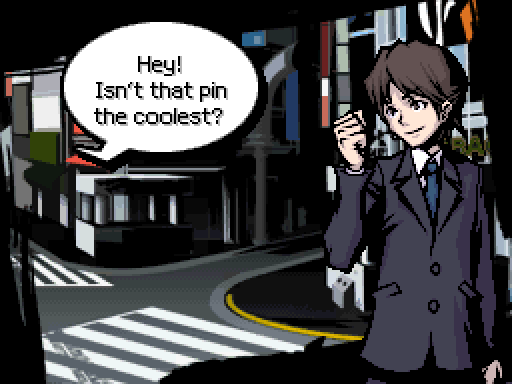 First, Im going to hand free pins out and fill Shibuya with walking billboards! Hmm...and to get peoples attention, I need some "hip" one-liners like that book suggested. Uhh...no? Theyre going to think youre nuts. : And pins arent exactly a hot topic to begin with. No ones going to take them. 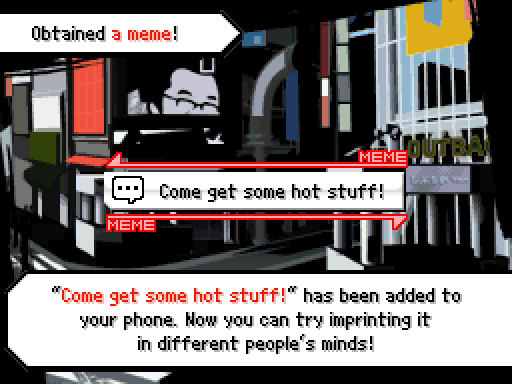 Yes, those lines are memes. 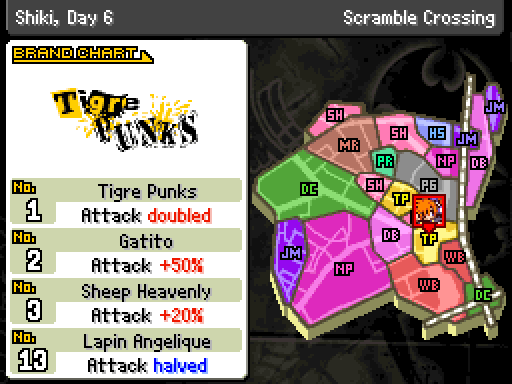 Compared to Shiki's mood the actual mission of Day 6 is goofy as hell. : Sota? Like, this guy. 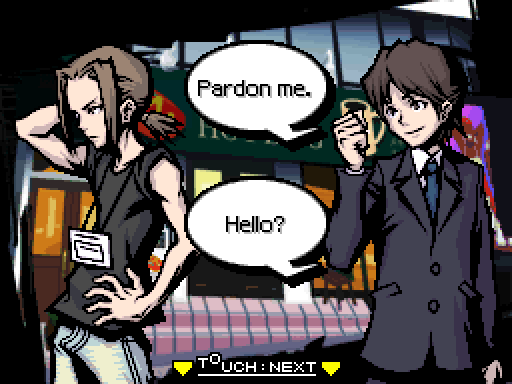 Hes, like, talking to me? : Got somethin' to say to my Nao? : Like, he said he thinks Im cute... Right? : Wr-wrong! I dont think that at all! : Ahhh! No no no no, shes cute! But not...you know...ahhh! It's trial-and-error to see which one is correct. I just happen to remember some of this. : I mean...umm...My...my grandpa! Its my grandpa. Hes...hes all gnarly! : F-from his arthritis! 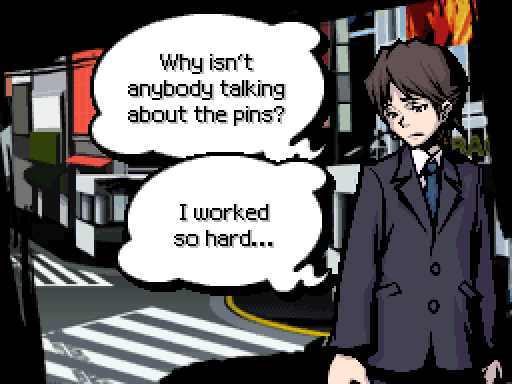 The poor man beats himself up because no one wears these pins. When I see his gnarly hands tremble with guilt, I... I just...Ohh, Grandpa! 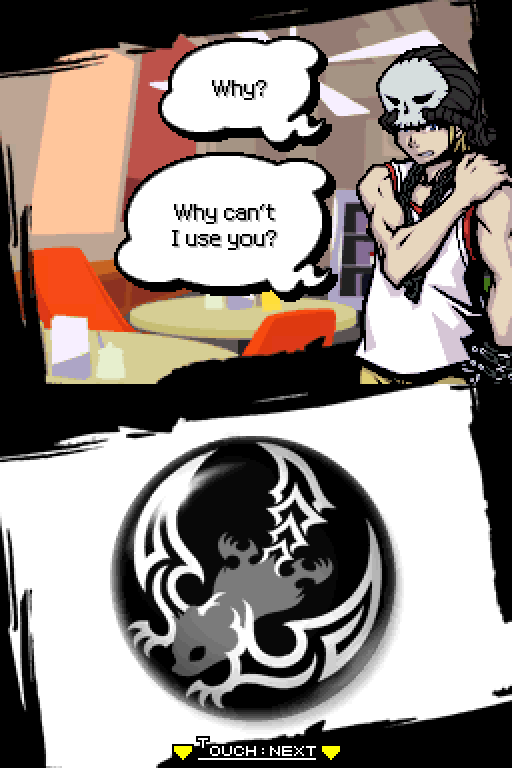 ......So, um... Would you do me a favor, and wear one of these pins for him? 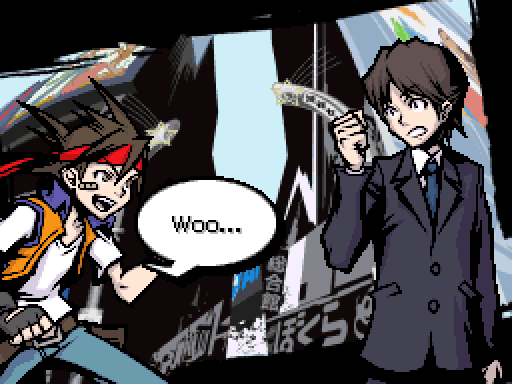 : Its...Makoto Miki. Friends call me Mick. : Mick... Youre a good man. : Yeah! Like, that was totally moving? : Handing out pins for your grandpa in the scramble... Thats aces, dawg. : Like, I think Im in love? : Well wear your pins. Itd be an honor. : Hang in there, Mick. Well be rootin for you. : Hope your granddaddy, like, cheers up? We follow Mick to the center street entrance. : Lemme guess, bro. You want me to make you one of my Slammurai... Right? : Dont be shy! Its cool! 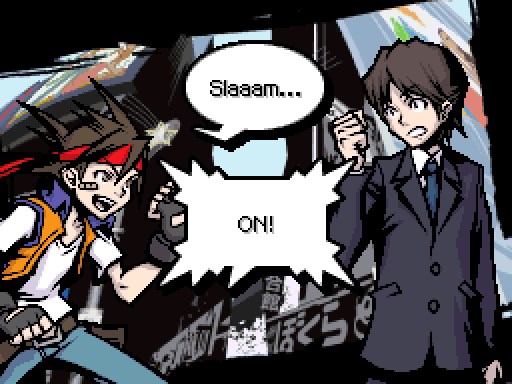 SLAM ON!!! : Whats your favorite whammy? : What are you ranked? 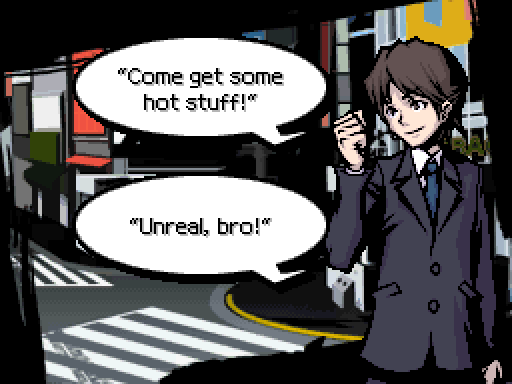 I suppose you have a hint from his use of "bro" here. 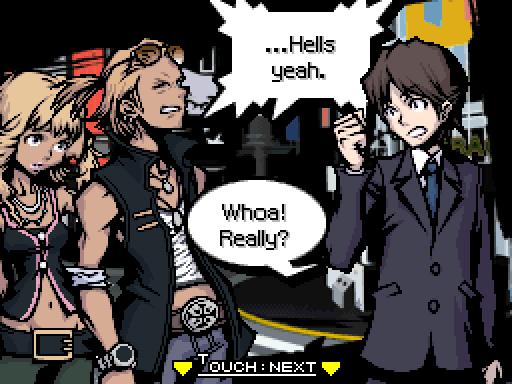 : Yeah! Tell me where you got it! : Seriously? How about its Defense? : Whoa! BRO!!! 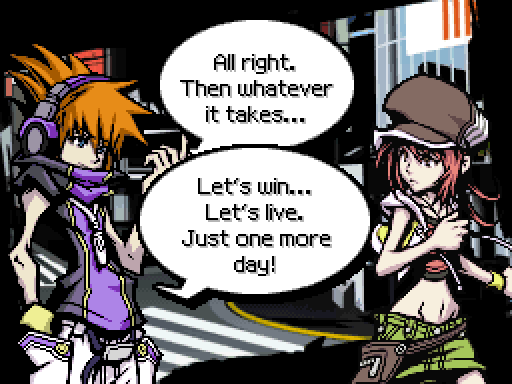 You and me gotta battle. 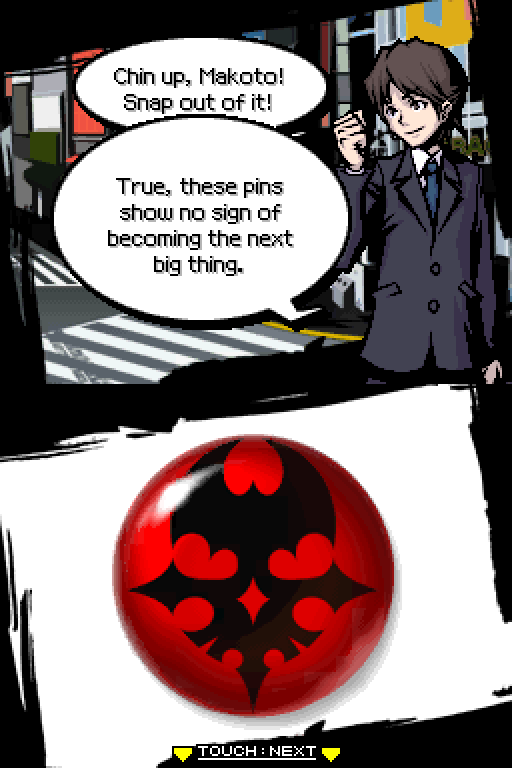 I want that pin! Then there is a blinding flash of light! Shooter is good at Tin Pin. : ...hoooooo! 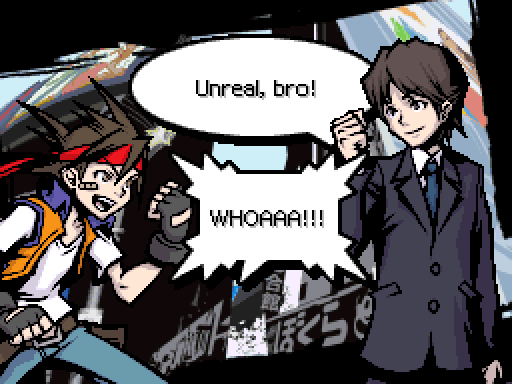 I won, bro! Better practice up. Rely on pins alone...and youll never be a true Slammurai! Ill be taking that pin. YOINK! : Huh? But... OK... It worked! The last location is Spain Hill. : Excuse me! ...... Cant he hear me? What now? Come get some hot stuff video: Come get some hot stuff! This is a large part of why I love this game. Mick runs back to the scramble. We follow him. Oh, come on. 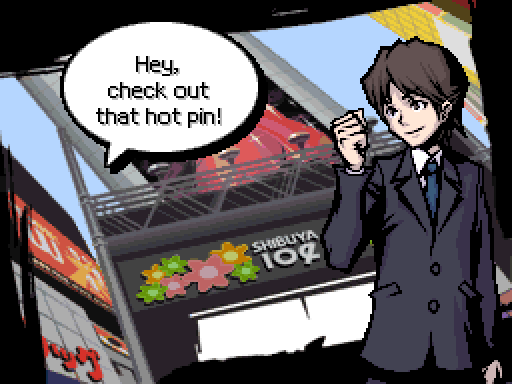 Handing out a few pins isnt going to ignite Shibuya. We better go after him. : ...... Just...give it up. : Hey! Whats gotten into you? Hey, what gives? 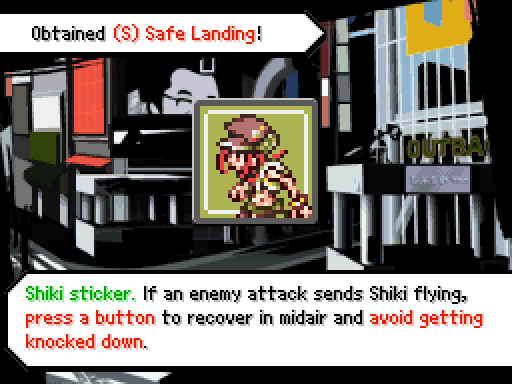 Shiki runs to the other side of the Scramble. Youve been acting really weird today. Its almost 3. We need to get moving, or well fail the mission. : ...... I thought Id changed. But Ill never change. Ill just go on hurting. : I wanted to change, to be somebody else. 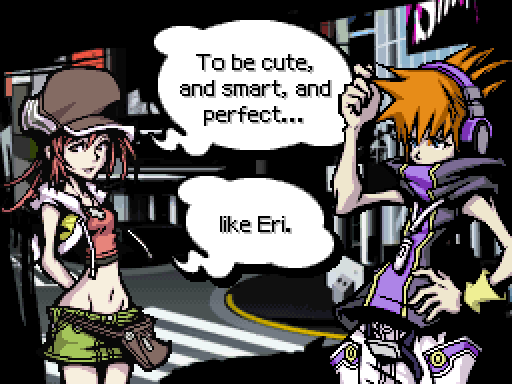 ...... To be Eri. : But it didnt work. : I dont-- WHOA! Over there! Is that...you? : Hey, why dont we head over there? Youve still go some time, right, Eri? : ...... What my entry fee was. : My appearance. I gave up the way I really look. : When I got to the UG and I saw myself... I freaked. : Yeah. I would, too. : But it was a happy kind of freaked. : Because this is what I always dreamed of--a new me. I hated who I was. All I wanted was to like myself. 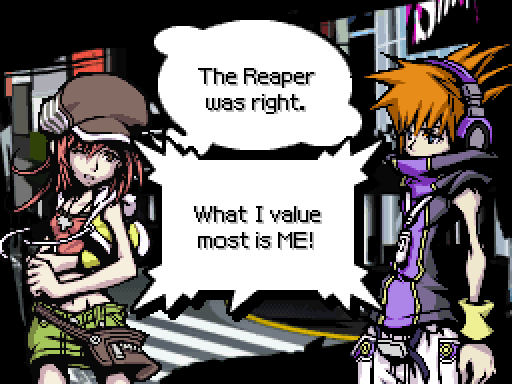 ...... Then why would the Reapers take your appearance? Your entry fee is suppused to be what you value most. But you just said you hate yourself. : At first... I didnt get it either. 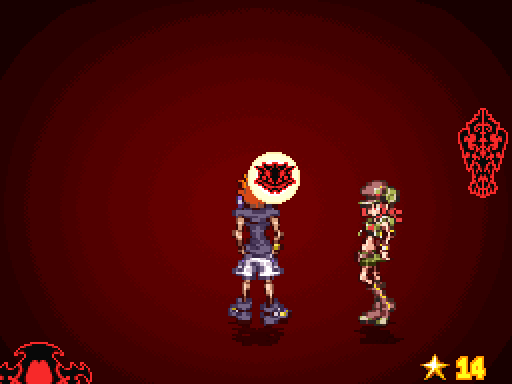 I was so excited to be Eri that I even acted like her--all bubbly and cute. But it was just an act. Inside, nothing changed. Im still the same person Ive always been. Then I realized. 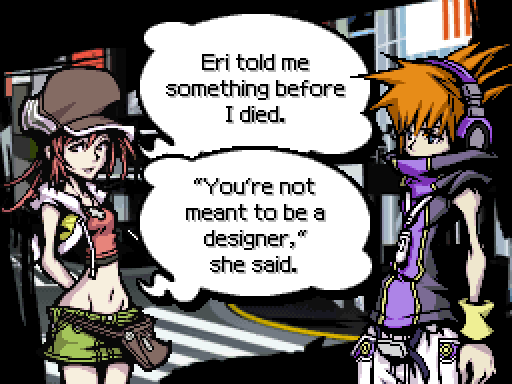 Ill never be Eri. Deep down, I never wanted to be. I was just jealous. 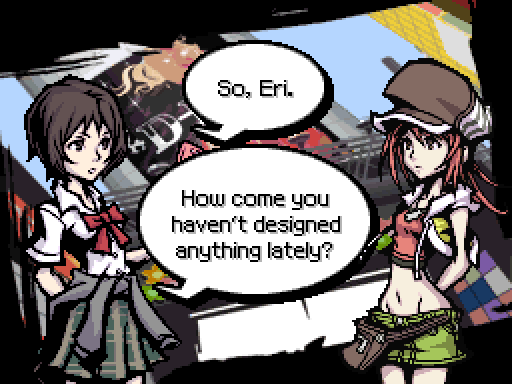 : Eri has all the things I dont. 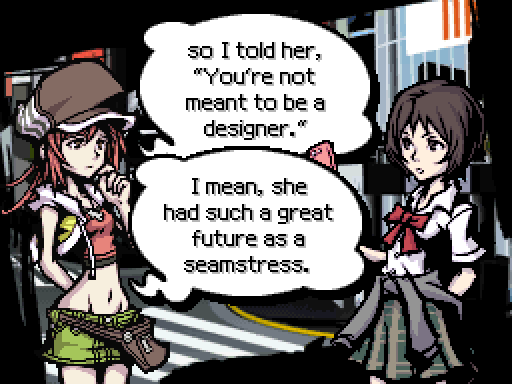 Looks, brains, design sense. Lots of friends...I envied her. And now that Im inside her body, it just hurts even more. 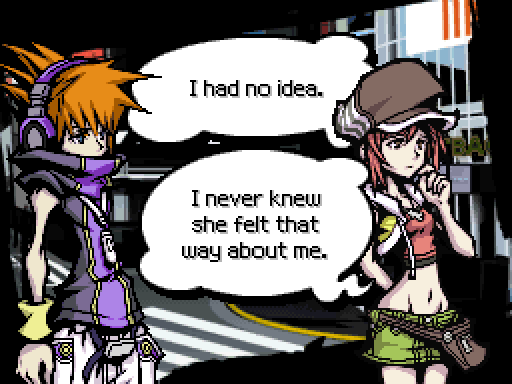 : ...... All this time...shes been as confused as me. : Im scared of getting a second chance! 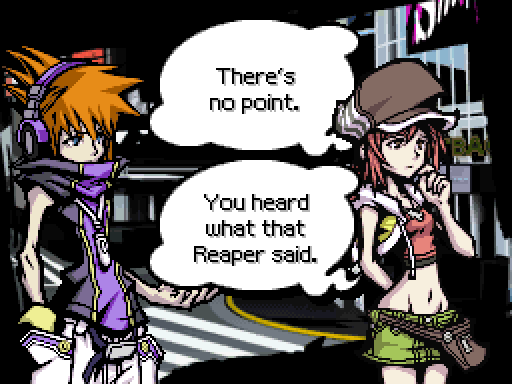 What if its like the Reaper said? I dont want to come back to life it means being jealous of Eri all the time. :......I dont want to be that person. : Looks like we cant relax yet. Listen. Were going to finish this mission. So promise youll focus on that for now. OK? 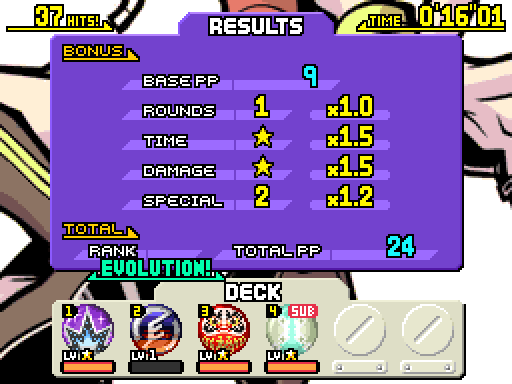 Murasame hit level 3 somewhere in there, finally letting me clear the last gate. 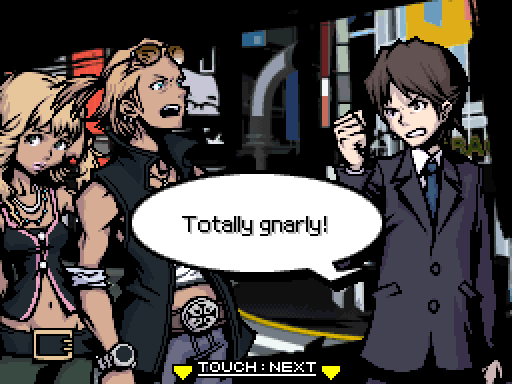 I think about now Shiki starts talking in battles again. 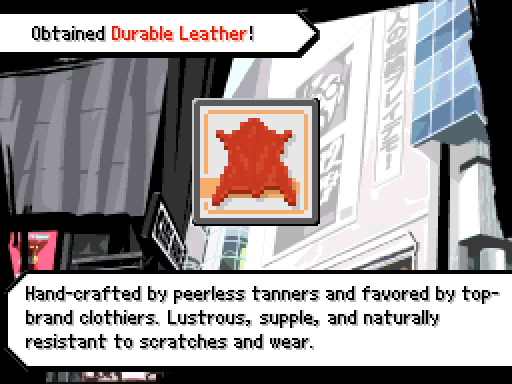 Oh yeah, he gives more leather. And I climb another tier of Shockwave pins. : Its work. Im going to lose my job. I was supposed to make these pins a sensation. I gave away a whole bunch for free. But they just wont take off. : Aw, Mick, you cant be serious. : All right, listen. Youve done good business for me, so Ill give it to you straight. Your pins wont take off, because youre ignoring the trends. Handing out samples doesnt make something popular. : Hmm. True... So then how do I change the trends? : OK. Ive gotta run. Press date. Take care, Mick. You can do it. : Thanks! Ill try! Hmm... Trends, eh? OK! If the Prince can do it, so can I! Time to put this pin on and start a revolution! : ...But think about it. 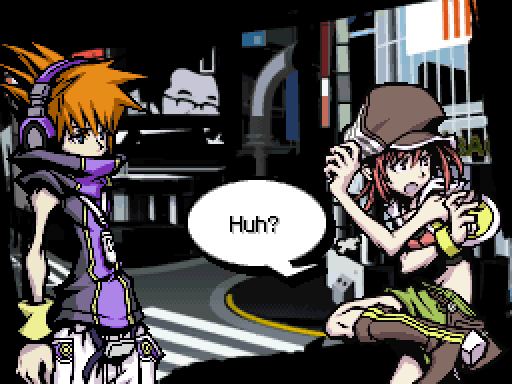 Neku, if you put the pin on and we fought some battles, we might be able to change the trends. : Rhyme and I got to talking. : Even though the RG people cant see us? : All right... Lets give it a try. Well now Gatito has fallen to 2nd place by the natrual flow of trends. Such is life. While Crawler is an annoying psych, Sweet Talk Tether and Ice Riser pick up enough of the slack that these battles aren't too bad. : There. The one that guys got on. : Oh yeah! Very nice. Wonder where they sell em. : Whoa... People keep looking at me and smiling. Am I... 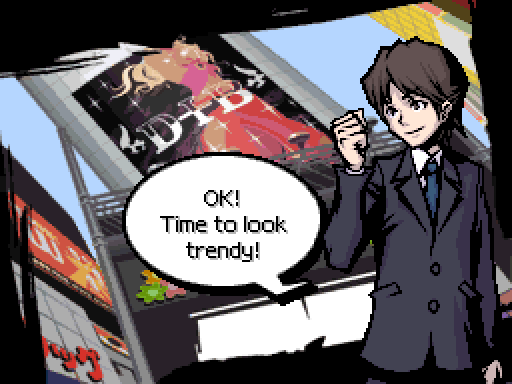 I couldnt be...trendy!? Wow. 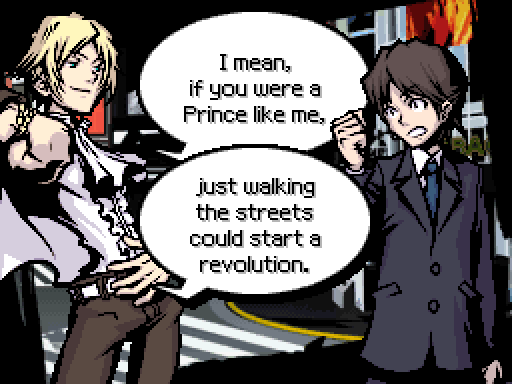 The Prince was right! : So the pins we wear in combat do change whats popular in the RG. : Uh-huh. But that guy seems to have his own theory. : Get ready, 104! 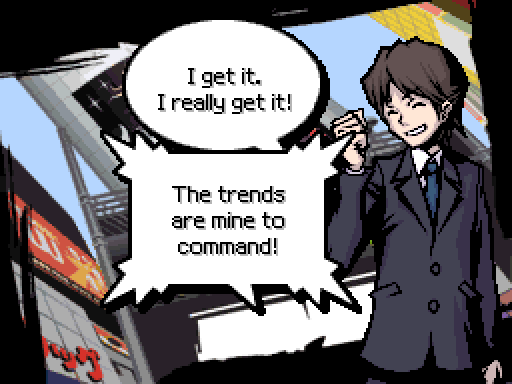 Your trend-god cometh! 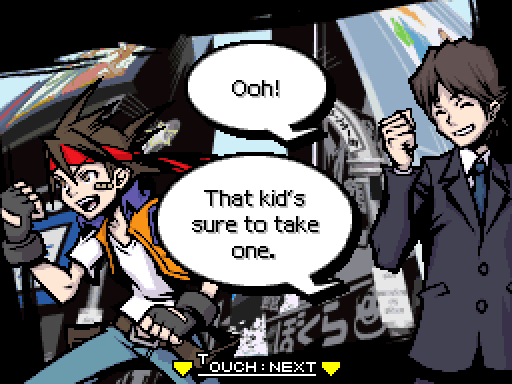 ...... Hes kind of a tool, huh? 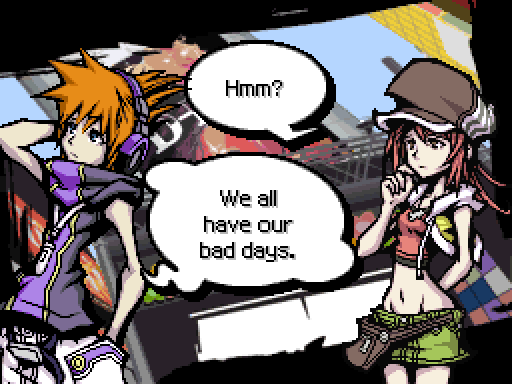 The World Ends With You handles negatives by just rolling with them. 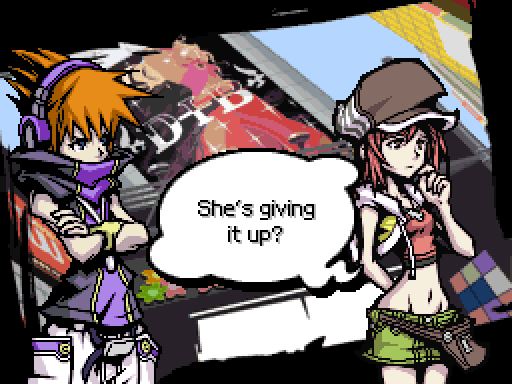 In this case, crawler and the bigbansprog are reducing Neku's movement speed to negatives, so he's moving backwards. : Now that the word is out, I just need to wait for the ad to run. Back to the crossing! : Well, we did it. : Hey, we gave it our best shot. Lets just cross our fingers. 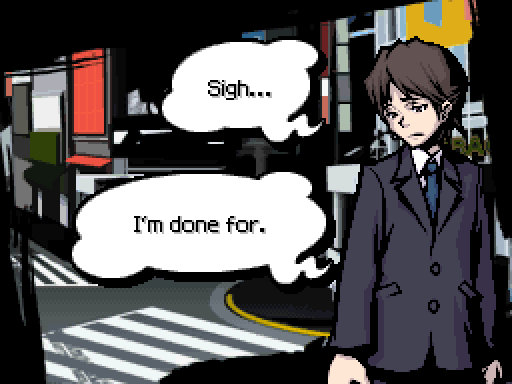 : ...... Actually... Im thinking about giving it up. 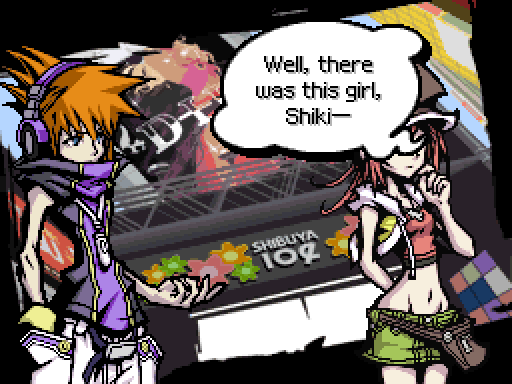 Yeah, since they have the same form Eri uses Shiki's expressions. 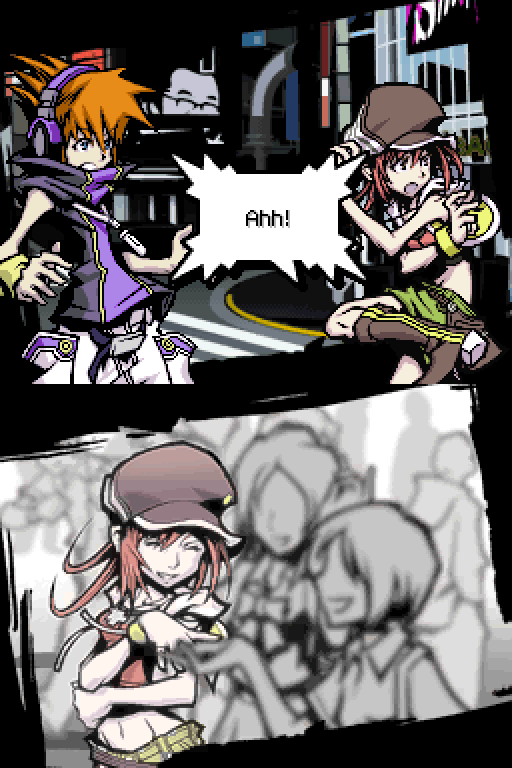 I will attempt to differentiate between the two and mitigate confusion by providing transitional screenshots, but if that isn't enough, remember that Eri is always talking with Mina, and Shiki is always talking with Neku. : What! Why? Youre so talented! : If you want to know, scan her. : What? I cant do that! Shes my friend. I cant eavesdrop on her thoughts! : Why not? Youve scanned tons of people. 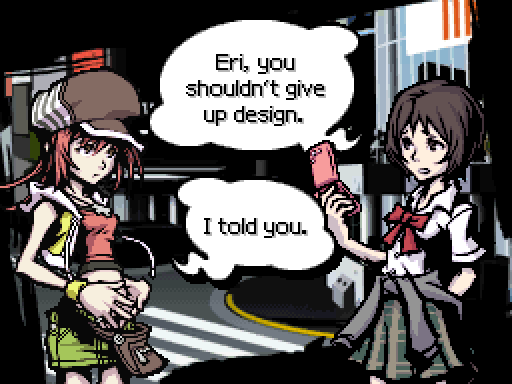 : Eri, why would you give design up? 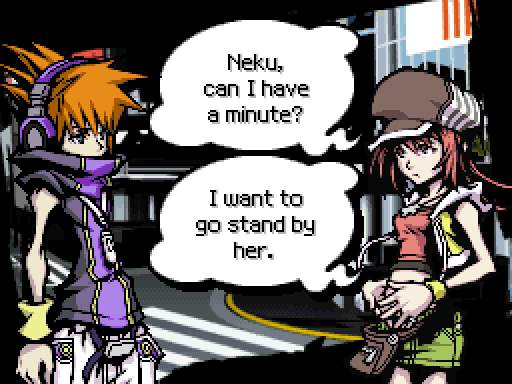 : Neku... I have to go! 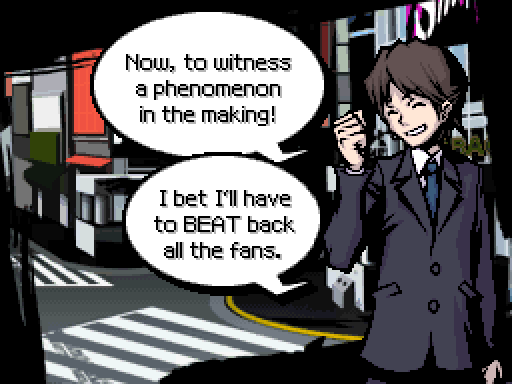 Shiki channels Hopkins FBI and runs back to the scramble. : I didnt want to hear Eri talk about me. I was afraid. : Oh, would you cut the crap? Who ARE you? : Youre you. 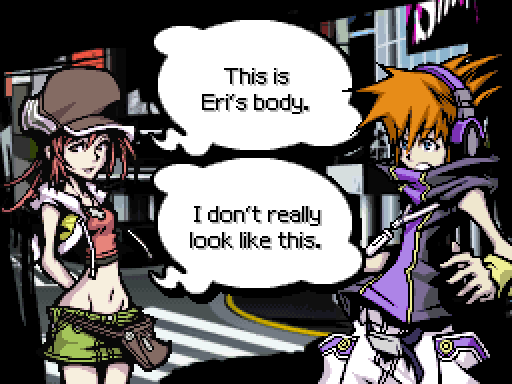 Youre not Eri. Youll never be Eri. Youll only ever be you. : Forget her! You need to live your own life. If she can do it, so can you. All that matters is you try. : Youre lucky youre jealous. : ......Youre right. 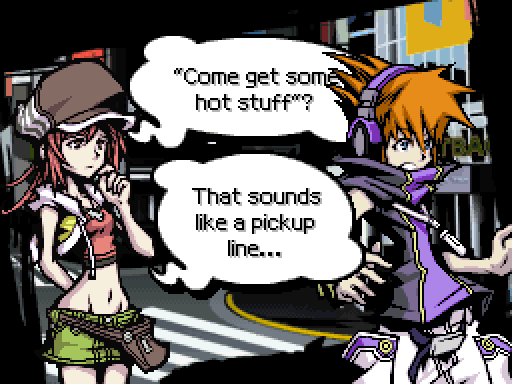 Thanks, Neku. : Its time. The commercials about to air. : Sooo nervous... Will people watch? : Dont worry. Theyll watch. : Where can I buy it? : Hey, youre off the clock. : This girl, Shiki--Im nothing without her. It's really awkward managing mugshots when you have two people who look the same. 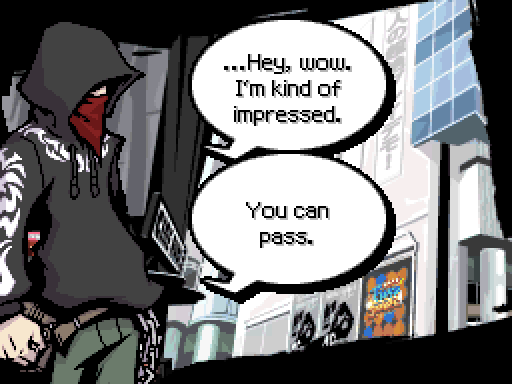 : Yeah, you said that. 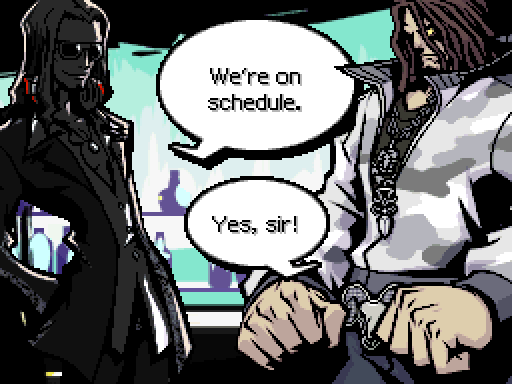 What, did you two have a fight? 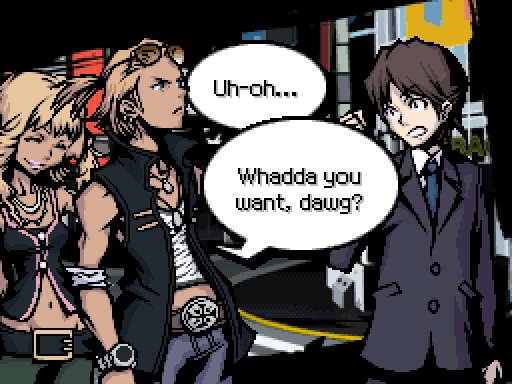 : A fight? I wish. 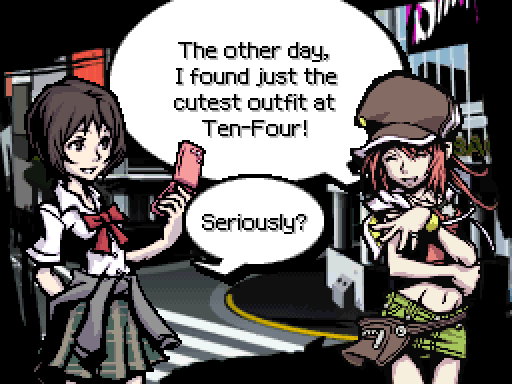 : No one else could ever make my outfits. 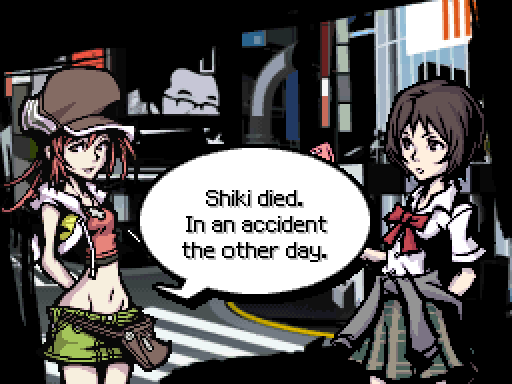 Shiki gave them life. Made them real. : You must have trusted her a lot. : I did! She was an amazing person. She cared about people--and always noticed the little things. 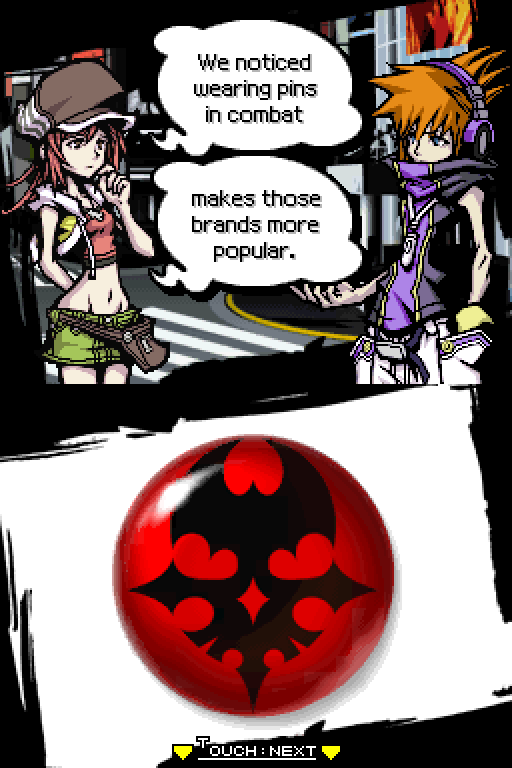 If I missed something in my design, Shiki always picked up the slack. And her stuffed animals! I wouldnt know where to begin. She had a sharp eye, skilled hands. Motivation. : All the things I dont have. : The way you talk about her, she must have been something. : ...... The day before her accident... I said something Ill always regret. : But I think I really hurt her feelings. I planned to apologize the next day...but I never saw her again. 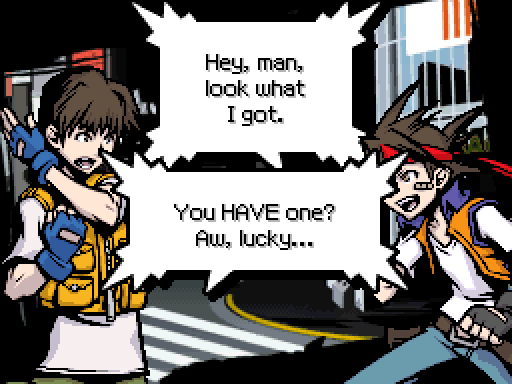 : Guess you two both need each other. 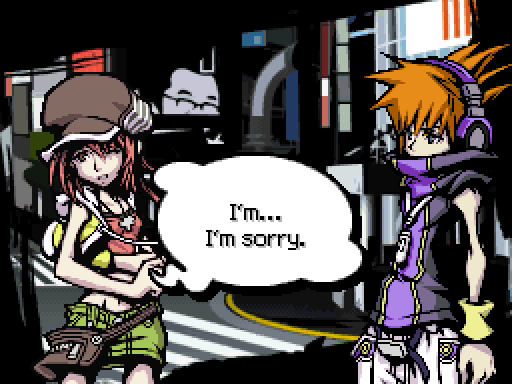 : Neku...You think Im OK the way I am? : Hey, Shibuyas got room for all types. Who else is gonna make stuffed piggies? : Hes a cat! 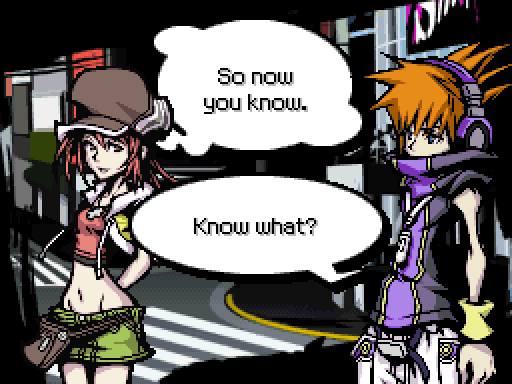 Heh heh... Neku... I want to see Eri again. 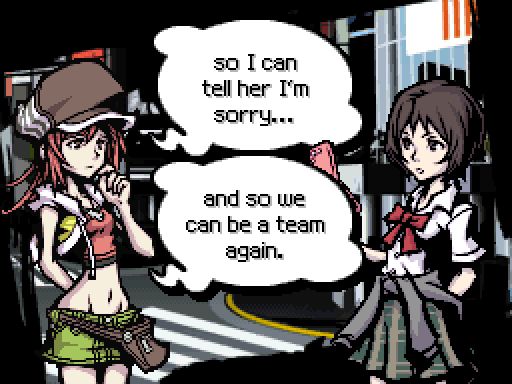 So we can be a team. Im ready for a second chance! : Three Players remain. Tomorrow I shall ice them personally. : I look forward to it. 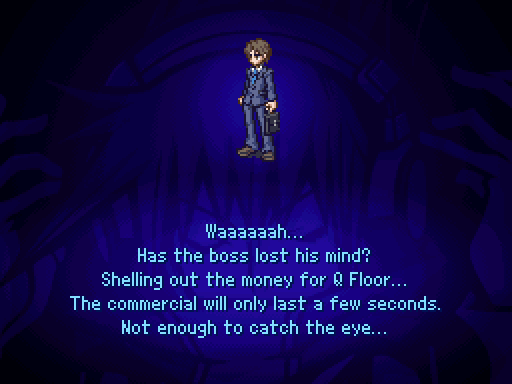 See this weeks Game through to its conclusion, and your promotion to Game Master is assured. : As your proxy, sir, I promise you I will not fail. 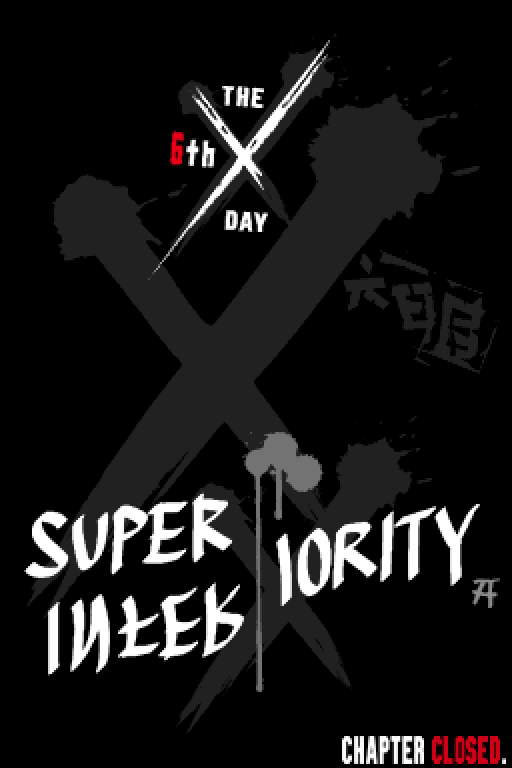 : You know, enough with this "proxy" business. Too formal. I hereby grant you full GM privileges. Youve proven you can handle it. : Sir! You are far too kind! I will check in again after tomorrows repast. : Yo, theres gotta be a way. :......THEY know. They gotta know! Yo, I am done sittin here collectin dust! : I just hope they can pull it off. 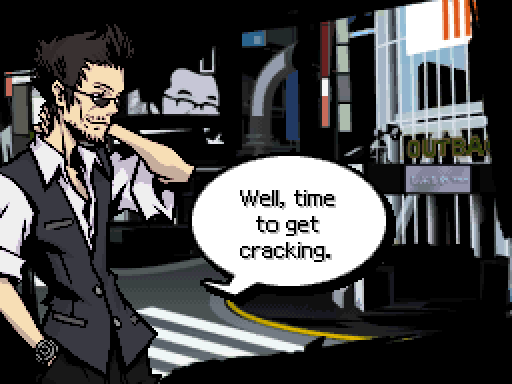 ......Back to the café, I guess. Beat must be starving by now. <@OFSheep> Somehow, this update alone accounts for about 1/6th of the images in my image folder. 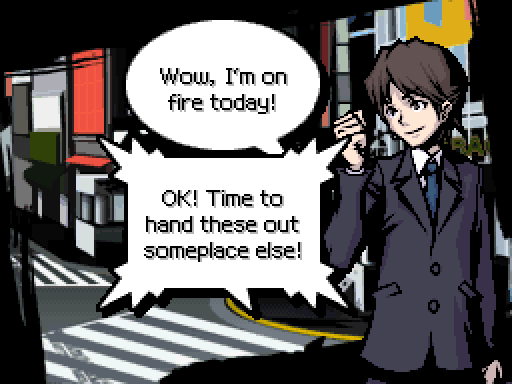 <@OFSheep> and bellowed, "Come get some hot stuff!"